Here's a post i've written over at Compass. So it is, in slightly less grandiose terms, with Ed Miliband and the ‘squeezed middle’. Much mocked by opponents, journalists and even colleagues (whispers from the Labour right of a ‘core vote’ strategy) when he first emerged wielding the term last autumn, the squeezed middle is now a settled part of Westminster lexicon. It is also one of the few Labour dictums of the last year that has managed to successfully make the journey from Portcullis House to the consciousness of ordinary voters. One reason for that is that the facts bear it out. Yesterday’s IFS report showed that those in the 2nd lowest income decile have experienced the highest average inflation over the last ten years. These findings take their place in a long line of evidence showing that low-to-middle income earners (defined by the brilliant Resolution Foundation as between the 2nd and 5th income deciles or e.g a couple with no kids earning between £12,000-30,000) have borne the brunt of both the recession and the Tories austerity package. But as the IFS data suggest, this is only part of the picture. 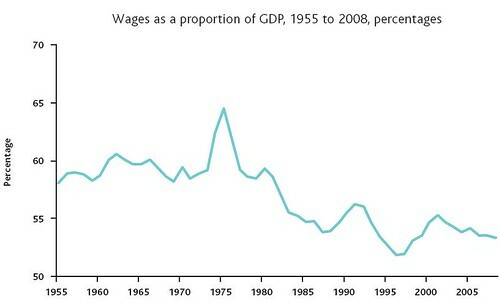 The fundamental problem pre-dates the recession: as the Resolution Foundation recently showed, median wages were actually stagnating even in the good years (2003-2008), before falling in the wake of a financial crisis that ended the easy credit which had been masking the entire phenomenon. Overall, real median wages flatlined in the last eight years and it’s estimated that even by 2015 they will still be lower than they were in 2001. Miliband has shown astute awareness of these facts, but it’s only one of a number of themes he has courted. Contrary to what some are allegedly arguing in the Shadow Cabinet, he should relentlessly pursue it, grab hold of it and put it on centre stage. Time and again he should hammer away on this; tailor it to every press release on the economy, shape it to every sound bite, public visit and question to Cameron in the Commons. It’s both good and expedient politics for him and the Labour party, for a number of reasons. Firstly, ‘Squeezed middle’ voters cut across working and middle classes, as well as varying parts of the country. Miliband has been criticised for refusing to choose between picking off ex-Lib Dems (particularly in the north) and focusing on southern, ‘soft’ Conservative voters. But honing in on low-to-middle earners, at least, bears that strategy out: they not only make up the bulk of voters in the north, but the recent Southern Discomfort Again polling shows they also “hold the key to Labour’s recovery in Southern England”. 41% and 47% of floating voters polled in Southern and Midlands marginals respectively say they are not confident they have enough money to make ends meet. This doesn’t eliminate need for a credible fiscal policy or tough choices. The Southern Discomfort polling suggests that concern about personal finances has entangled itself with perceived poor value for money in public services, hollowing out Labour’s economic credibility – the debate around the deficit seems to have fed in to these concerns rather than it standing alone per se in swing voters’ minds. As such any squeezed middle ‘narrative’ would likely have to be accompanied by some instinctively uncomfortable noises on spending/efficiency in public services. But it would get Miliband consistently talking about people’s back pockets in a grounded and recognisable way while the government stretches itself thin over NHS reform or Libya. Critics could argue that Miliband recently gave a speech on low to middle income living standards (where he launched a Commission), and the press reaction was lukewarm to say the least. Fair enough. But the big problem there seemed to be a lack of policy to hang it on: a few practical nuggets tailored to people’s specific needs would give it far more sense of direction and stop it becoming too broad or abstract. Some suggestions, alongside the living wage, would be a focus on building family accommodation to rent with secure tenancies (as proposed by Gavin Kelly) or even a cut in the basic rate of income tax (if he could stand the figures up). Secondly, although – if pushed - Miliband shouldn’t be afraid to be drawn on specific income brackets, because of the way the ‘squeezed middle’ has been explained (i.e those not rich enough to be comfortable but not poor enough to receive help from the state) it has the advantage of a dual message: it can also appeal to anyone who’s ever felt that they give more to the system than they get out, which (rightly or wrongly) is quite a lot. That’s why 48% of people polled think “when Miliband talks about the ‘squeezed middle’ he is talking about people like me and my family”. On this issue then, he has the public’s ear. He should take advantage now. In the long term though, the nature of flatlining median wages promises to challenge a number of assumptions underpinning our politics. 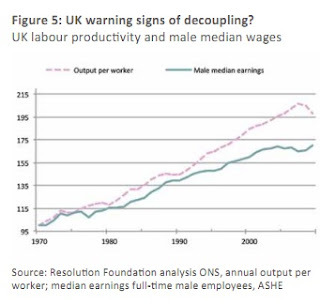 As the Resolution Foundation show, it seems to be happening in the context of a decoupling of ‘growth from gain’ widespread in Anglo-Saxon economies; that is, although our economy grew it didn’t trickle through to increased median wages (as displayed by labour’s falling share of proceeds and productivity v. median male wages). However, it has benefited those at the top in a massively disproportionate way – they have accelerated away relative to the middle while the gap between the middle and bottom has only slightly increased. “In 1992, ‘floating’ voters were aspirant and upwardly mobile. Today, they are far more cautious about their own prospects, prioritising security and a better future for their children." The point, then, is no longer to understand why (as in New Labour folklore) floating southern voters ‘want to build a conservatory’, but why they can no longer afford to do so. This is an opening for Miliband to re-shape the centre ground. First things first: stand firm on the 50p top rate of tax, maybe even think about suggesting it starts a few notches lower (to finance that cut to the bottom rate of income tax perhaps!). On the substance, however, the truth is redistribution will only mitigate the effects of the squeeze on wages – as New Labour’s tax credits did, for instance. If Miliband is to engage with the ‘squeezed middle’ and not over-promise, he has to meet the biggest long-term intellectual challenge of them all: changing the very structure of Britain’s economy and its relationship with globalisation, in order to tackle issues of inequality and wages further upstream. Contrary to mythology, growth driven by financial services has not benefited all. A shift to proper investment in green technologies, industry and infrastructure (as advocated by Dieter Helm) along with mutual ownership and wider union involvement might be a good place to start. The extent of Miliband’s engagement with the ‘squeezed middle’ thus far tells the story of his leadership: encouraging and perceptive in the abstract, but in urgent need of development. It is an idea whose time has come – to pick it up and drop it, or fade it in or out, at Miliband’s choosing would be to do it a great disservice. The Labour leader is on to a winner – but does he know it?